Canon PowerShot SD700 IS Digital ELPH (product name in North America) or Canon Digital IXUS 800 IS (name used in Europe and Asia) is a 6 million pixel ultra-compact point-and-shoot digital camera which features Canon’s optical Image Stabilizer, 4x optical zoom, ISO of up to 800, wide viewing angle 2.5-inch LCD, Canon’s DIGIC II image processor, iSAPS, 9-point AiAF, 16 shooting modes, My Colors photo effects, widescreen (16:9) stills recording and 30fps VGA movies. 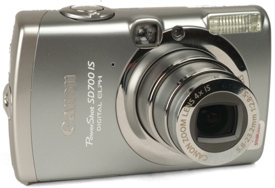 More features and specifications can be found at Canon Digital IXUS 800 IS (no longer available) or Canon PowerShot SD700 IS Digital ELPH official homepage. CNet (dead link) reviews Canon Digital IXUS 800 IS and concludes with the very good rating of 7.8 out of 10 on the camera that the Canon Digital IXUS 800 IS is a very strong, compact digital camera that produces great pictures. Its price is a bit high compared to that of its little siblings, the IXUS 60 and IXUS 65, but its great image stabilization and subsequent blur-free photos are worth the extra few quid. DigitalCameraInfo (dead link) reviews Canon PowerShot SD700 IS digital camera and concludes that the Canon PowerShot SD700 IS packs a solid set of components into its sturdy and trendy body. This 6-megapixel digital camera has a 4x optical zoom lens that is lengthier than the average and nicely complemented by an optical image stabilization system. The system has several modes optimized for different purposes like saving battery power and shooting horizontally moving subjects, but all of them work really well, both works when snapping still images and when recording video. While the Canon SD700 also has an optical viewfinder, it is more for decoration than anything else. Its inaccuracy and blurry view is nearly useless, but the 2.5-inch LCD screen is much more inviting to look at anyway, even with a disappointing 173,000-pixel resolution. A 100 percent accurate view and a wide viewing angle that can be seen in bright daylight or the dark of night are definite assets. However, the Canon PowerShot SD700 does have its quirks: it has a cool Jump feature to navigate large amounts of photos, but no deletion feature to scroll through and select a partial order of pictures to delete. The viewfinder is inaccurate and the handling is complicated by the small size. Perhaps the biggest impediment for the Canon PowerShot SD700 IS is its price. At a time when other manufacturers are offering similar features for $399 or less, the SD700 is being released at a retail price of $499. Sure, it has an awesome image stabilization system and takes excellent pictures but it will sure hurt the pocket book. Digital Camera Tracker (dead link) reviews Canon PowerShot SD700 IS and concludes with rating score of 8.5 out of 10 that Canon’s SD700 IS was enjoyable and easy. In the picture quality area there is nothing to complain about because the SDF630 delivers outstanding photos with vivid color. It’s fast to turn on, power up and recycle time between shots seemed almost instantaneous. This camera has the Point-and-Shoot photographer written all over it. It’s fast, it’s stylish, and it’s reliable. But it’s not cheap! This camera is NOT for anyone who needs/wants control over aperture and shutter speeds. While the cmaera does have a manual setting is a bit of joke. Steve’s DigiCams reviews Canon PowerShot SD700IS and concludes that the PowerShot SD700 is another outstanding member of Canon’s Digital ELPH series, offering great image quality, robust performance, and useful exposure modes, all packed in an ultra-compact, durable and stylish shell. It’s sure to make an excellent choice for any user in the market for an extremely pocketable 4x zoom, high resolution digicam. At about US$499 MSRP, it is roughly $100 more expensive than its SD630 sibling, but its combination of 4x optical zoom lens and Image Stabilization will be worth the extra cost to those who need those features. The Age reviews Canon Ixus 800is digital camera and concludes that Canon Ixus 800is goes to the top of the list of pocketable digicams alongside Sony’s DSC-W100. The Sony has more pixels on a bigger sensor but the Canon wins in the glamor stakes. Both have optical viewfinders. The Canon has image stabilization and costs $100 more. Both are highly recommended. Digital Camera Review concludes that “with several trade shows to attend each year, a couple of my colleagues ended up with the SD700 IS. They don’t like to carry large cameras, but were getting increasingly disappointed with the images from their older, slim cameras that didn’t do well in low light. With the SD700 IS, they get a camera that can take excellent shots of the latest and greatest electronics in the sometimes challenging light of trade show exhibits. All while still being small enough to easily pocket and not be too noticeable. ComputerAct!ve (dead link) concludes with rating of 4 out of 5 that Canon Digital IXUS 800 IS is a valiant attempt to deliver a good-looking top-end compact that comes with a full complement of useful features. Though the 800 IS is very similar to the IXUS 65, the extra $50 for the 800’s image stabilization feature and lens reach is worth it. It’s not infallible, but comes close.